Now, almost two weeks after the event, as I try to assemble a tidy picture of the sway and flow of our numerous discussions, an image comes back to me: a horn, black, from the mouth of which spills a jumble of colourful shapes, like fruit. But the shapes are not fruit. They are discarded buoys. And the horn itself, charred and spiky, is made from junk – a thousand pieces of salvaged ocean plastic, gathered on beaches from Greece to Alaska to Mexico. The piece is an artwork by Pam Longobardi, entitled “Bounty, Pilfered”. It looks like the carcass of a mechanical whale, vomiting up its trashy innards: matter out of place. The image flashes on a screen at the back of the room. It is one of a series of compelling, and quite beautiful works of art made from discarded plastic that is shown during Jennifer Wagnor-Lawlor’s talk in the final panel of the Stellenbosch Dirt Colloquium, held on 20 March in the English Department at Stellenbosch University. Wagnor-Lawlor talks about plastic: about the sheer materiality – even the recalcitrance – of the stuff that clogs up our oceans and litters our beaches. What is the nature, she wonders, of this obscenity of plastic that insists on showing itself, that refuses to stay away? Where is this mythical “away” where junk is supposed to go when we discard it? The image of the blackened horn from her talk strikes me as a fitting one for the colloquium in its entirety. Eleven panelists – from Stellenbosch, mostly, and Cape Town, but also from distant northern places like Sussex and Pennsylvania and Småland – talk on a range of topics surrounding the notion of dirt. From filth and dross our panelists pick their subjects, filling our horn of plenty with the bounties of waste. The colloquium is organized into three panels: “Waste and Accretion”, “Unclean Life” and “Affected Landscapes”. 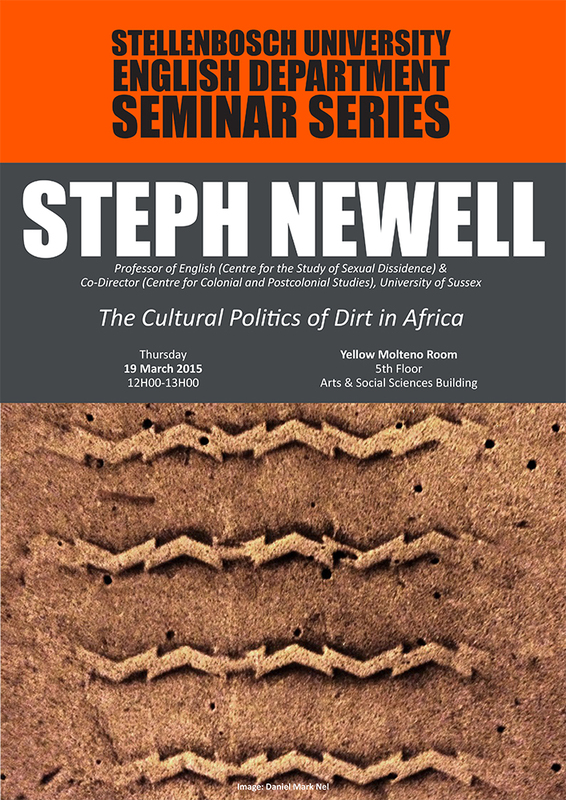 But first, on the day preceding the colloquium, Steph Newell from Sussex delivers the keynote address, entitled “The Cultural Politics of Dirt in Africa”. The focus of her talk is urban Africa – Nairobi and Lagos especially – and the ways in which urban African identities are mediated by categories of dirt. She skirts the moral aspects of dirt, focusing instead its social and visceral realities. How does dirt signify through cultural networks in Africa? How could we begin to make the category of dirt a productive one? An extract from a Nollywood film (“Malaria, Ebola”) rounds off her address. Men and women hurry through the streets of (presumably) Lagos, carrying bags of salt: a viral superstition, travelling faster than information, has taught them that drinking salt water protects against Ebola. It is an example of the massive social impact which the disease, and the ideas of contamination surrounding it, has had on the populace of the city. On the morning proper of the colloquium the “Waste and Accretion” people go first. Megan Jones opens a theoretical trajectory that investigates the presence of waste in the teeth of pervasive neoliberal modes of association between subject and object in an African context. How do we think beyond economies of commodification, she asks, to account for those that fall outside the margins of modernity? What do Rem Koolhaas’s “rubbish economies” and Edgar Pieterse’s “rogue urbanisms” teach us about ways of life that do not fit into the brutal logic of capitalist consumerism? Gabeba Baderoon picks up on the topic of superfluousness – of those who fall by the wayside of official discourse – with a talk on “Race, Numbers and Excess in South Africa.” How does it happen, she asks, that certain people – notably the approximately 3.5 million people that were forcibly removed in South Africa between 1960 and 1983 – become excess, become waste? Baderoon argues that the Eden once envisioned by colonists failed to materialize because the landscape they encountered when they first arrived refused to be empty – hence the transformation of the indigene into a mere number, susceptible to excision. Louise Green closes the panel with a talk on the anthropocene. A series of hugely unsettling graphs that link human activity to massive spikes in detrimental environmental effects, beginning in the 1950s – the so-called “Great Acceleration” – is the starting point for her thoughts on the collapse of the divide between society and nature. These thoughts, in turn, lead to a provocative discussion of the ways in which our methods of critique need to adapt to the new realities of the anthropocene, or to find new ways of relating data to reality. The second panel (“Unclean Life”) brings together two papers on animals, one paper on smoking and another one on Ebola. Maria Olaussen delves into José Eduardo Agualusa’s The Book of Chameleons, asking questions about the ways in which animal and human bodies relate to each other beyond the limits of language. Rosemary Jolly situates the spread of, and reaction to Ebola in a conceptual nexus that incorporates elements of zombie studies and the posthuman. In my paper I consider the monstrous figure of the baboon in Eugène Marais’s The Soul of the Ape. Tilla Slabbert peers into the fumes of taboo with a talk on cigarettes and the banishment of smokers to the margins of society. A common thread that binds these papers together, we discover during our discussion afterwards, is the notion of outsidership. We tell ourselves that literature is one thing that prevents the vilification of all those who do not fit the bourgeois individualist conception of the human. In addition to Jennifer Wagner-Lawlor, whose talk of plastic opened this report, the final panel (“Affected Landscapes”) comprises Wamuwi Mbao, Sally-Ann Murray and Hedley Twidle. Mbao’s paper enters into the topic of abandoned urban spaces, asking how the inner city of Cape Town collapses the borders between margin and mainstream. Murray tries to locate herself as a subject among the dumps and the dead animals of Stellenbosch, plumbing the discourses of waste and dirt as she does so. Twidle speaks about the funk surrounding the statue of Cecil John Rhodes at the University of Cape Town, and goes on to connect the remnants of colonial presence to the present-day corporate mentality that has encroached upon – indeed, has all but usurped – public space on campus, in the form of bombastic roadshows for popular commercial brands. It is a fitting end to a surprisingly rich, surprisingly diverse cornucopia of topics. I am reminded of a comment Steph Newell made during her opening address, one that was echoed by Megan Jones in her presentation, concerning colonial outrage at seeing objects of consumption being used outside their ordained colonialist paradigms. What the topic of dirt most succinctly offers us, it seems, is a way to challenge all those sanctioned forms of commerce and consumption that have led to the quagmire we inhabit today. 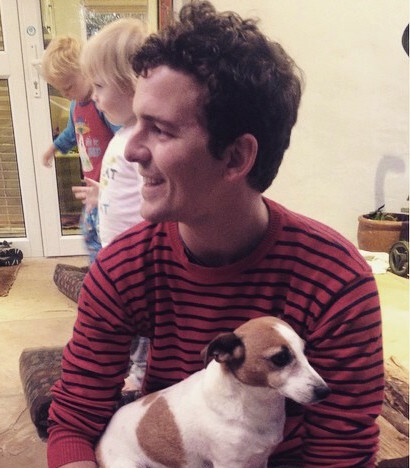 Eckard Smuts is a postdoctoral researcher in the English Department at Stellenbosch University. His PhD work focused on Romantic legacies in the work of J.M. Coetzee, but he is now thinking and writing about baboons in the literary-cultural history of South Africa. thank you for a lovely description of what sounds like a fascinating conference!